4 Day Gallipoli Troy Pergamon Ephesus And Pamukkale Tours are a daily departure tour package which covers the sites of history, war and nature in Turkey. Ancient Cities of Troy, Pergamon, Ephesus and Hierapolis, Nature of Pamukkale. 4 Day Gallipoli Troy Pergamon Ephesus And Pamukkale Tours package included professional Turkish and English Speaking Tour guide during the tours. 4 Day Gallipoli Troy Pergamon Ephesus And Pamukkale Tours, everything was excellent, we have spent great time and had excellent experiences. Our tour guide mustafa was excelleand and knowledgable and informed us well and helped us for all our needs thanks to him and safer driver ismail. All the best for everyone. Visiting: the sites to visit as follow the Beach Cemetery ( John Simpson's Grave ), Anzac Cove, Ari Burnu ( First Anzac landing place ), Lone Pine Cemetery ( Australian Memorial ), Johnston's Jolly ( Walk in the Anzac trenches ), View Shrapnel Valley * Turkish Memorial, The Nek and Walker's Ridge, Chunuk Bair ( Main New Zealand Memorial ). At the end of the tour, drive to hotel, check into hotel and Overnight. Visiting: the sites to visit as follow the Trojan Horse which was used in the movie Troy and the Trajan Horse which The Trojan Horse (Did it really exist ?) in centre in Canakkale, The Trojan Wars, Battle between Achilles an Hector, The 3200 years old city walls of Troy VI and VII, The East gate of VI (VIP entrance of Troy VI), The Temple of Athena, Walls of Troy II and Megaron House, Walls of Troy I (The oldest ruins of Troy), he trench of Schliemann, The ramp of Troy II, The Scaean Gate, The Gate of Troy VI (Where possibly the tricky wooden horse was taken), Sanctuary (Sacrificing Altars), Roman Bath, Odeon (Music theatre), South gate of Troy VI, Bouleuterion, Ruins of agora (Market place). At the end of the troy tour continue to Pergamon. Visiting: the sites to visit as follow theThe ancient Pergamon, which once the ancient world's major power, The Acropolis, The Library once held 200.000 books and Trojan, Temple of Athena, Temple of Trajan, Altar of Zeus ( Now at BERLIN MUSEUM ) The Gymnasium situated on terraces, The lower Agora, The Hellenistic Theater with a seating capacity of 10,000, Temple of Dionysus. 16:30 PM At the end of the tour, drive to Kusadasi via Izmir and Selcuk. Arrival to Kusadasi. 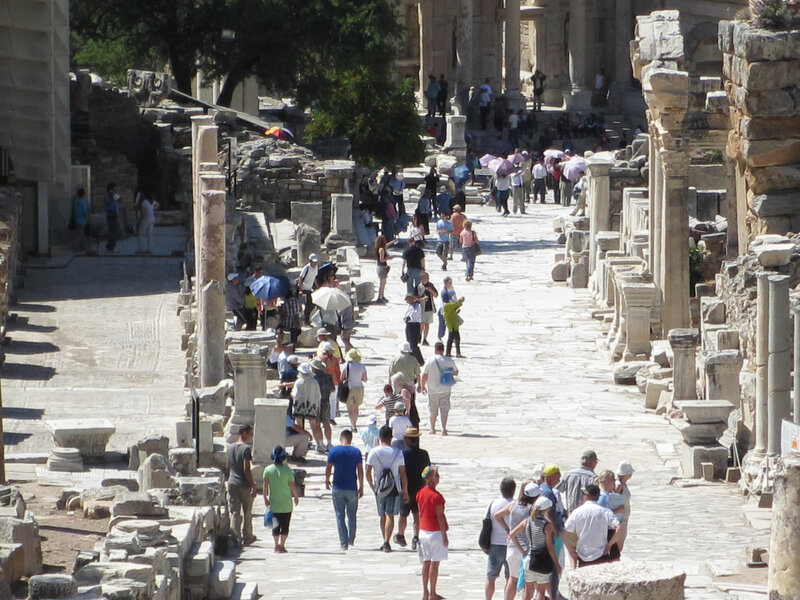 Visiting: the Ephesus Ancient City, the celsus library, the Temple Of Hadrian and the Trajan Fountain in the Ancient Ephesus, the historical marble street, the Great Theater, Isa Bey Mosque, shrine of Mother Mary, Temple Of Artemis (Diana), (seven wonders of ancient World), Sirince Village. Visiting: the visit the Hierapolis ancient city, Necropolis, Roman Baths, Domitian Gate, Latrina, Oil Factory, Frontinious Street, Agora, Byzantium Gate, Triton Fountain, Cathedral, Apollon Temple, Plutonium, Theater, Antique Pool. At the end of the tour. Transfer to Denizli airport to fly back to Istanbul. 16:00 PM The end of the tour, Leisurely time in Pamukkale. 17:00 PM Transfer to Denizli Airport. 19:15 PM Flight from Denizli to Istanbul arrival and transfer to hotel. 20:35 PM Arrival to Istanbul and then transfer to hotel, is the end of the tour package. - Turkish and English Speaking Progessional Tour Guide, licensed by the Ministry of Tourism. 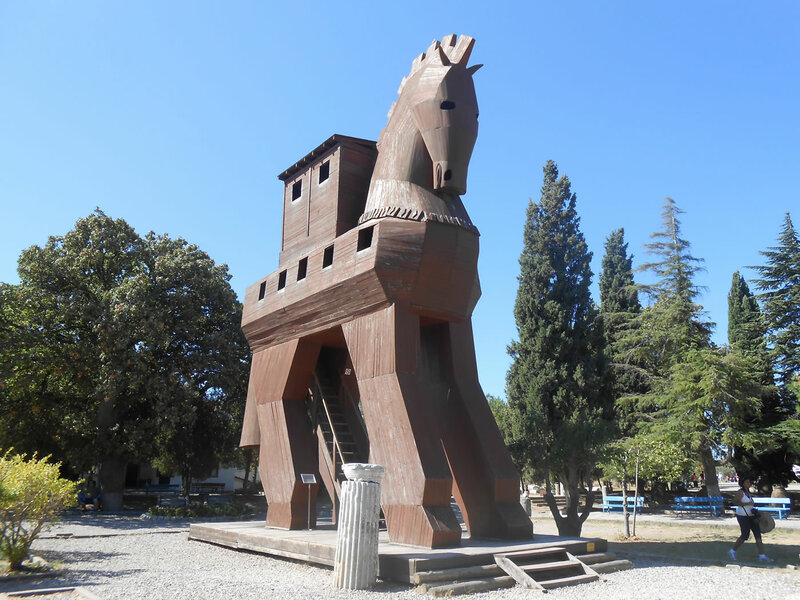 - Guided Troy Ancient City And Trojan Horse Tour. 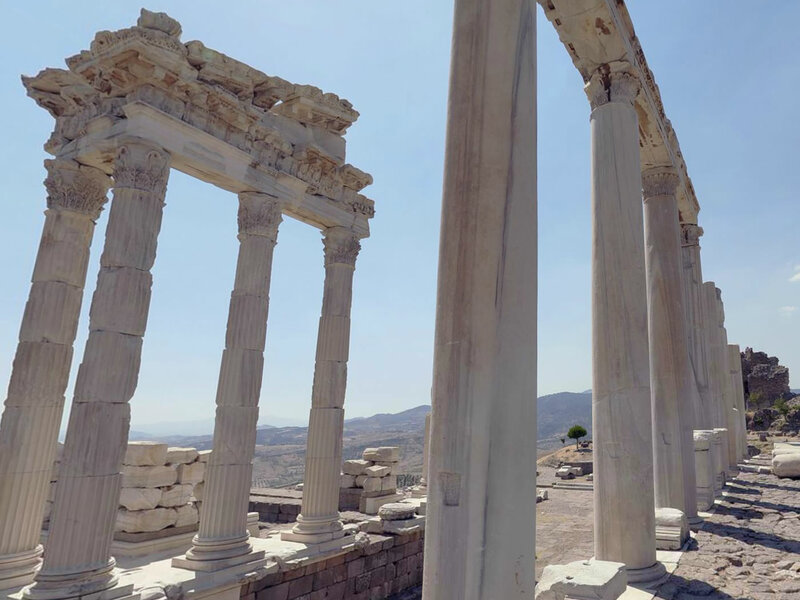 - Guided Pergamon And Asklepion Tour. - Lunch (Open Buffet, Vegetarian menu is available). - Breakfast (Open Buffet breakfast). - Transportaiton by non-smoking and air-conditioned touristical vehicles. - Airport transfers in Pamukkale, Istanbul. You can choose one of the following hotels below for each town for your accommodation during the package of 4 Day Gallipoli Troy Pergamon Ephesus And Pamukkale. Canakkale. : Kervansaray Hotel or Helen Hotel, Iris Hotel. Kusadasi. : Ilaydavantgarde Hotel or Efeboutique Hotel or Derici Hotel. - Some of Turkey Tours has walking and not recommended for the people who has difficulties with walking. - When you book the one of Turkey Tours the confirmation will be received at time of booking. - We kindly request our guests to be ready 10 minutes before pick up time of for the each day tours. - When guests booked the package included flight tickets (Time for airport transfers and flihgt details) will be provided after booking. 4 Day Gallipoli Troy Pergamon Ephesus And Pamukkale Tours, wherever you go, go to 4 Day Gallipoli Troy Pergamon Ephesus And Pamukkale Tours, to visit the history, nature and the history of the war. It was a great cultural package to see the sites and have some experiences about the war wwwı. in Turkey, the 4 Day Gallipoli Troy Pergamon Ephesus And Pamukkale Tours which we have had, covered everything and just we enjoyed the rest of the things. Thanks to Mr. Senol who arranced every single details for us. 4 Day Gallipoli Troy Pergamon Ephesus And Pamukkale Tours, It was with great service of knowledgeable and friendly tour guides. All the best. 4 Day Gallipoli Troy Pergamon Ephesus And Pamukkale Tours was started with a great morning in Istanbul, driving was long from Istanbul to Gallipoli but was nice sightseeing on the way. There was different tour guide during the tours of Gallipoli, Troy, Ephesus and Pamukkale all they were great and knowledgeable. The hotels were clean and in the city centre, after the tours it was easy to go some where for dinner and walk in the city center. The transportation was on time and everything was excellent, thank for giving us great time in Turkey. The tours with a professional tour guide and service of the 4 Day Gallipoli Troy Pergamon Ephesus And Pamukkale Tours was excellent, we have got great experiences about the historical ancient world and the wars. I highly recommend this tour package to everyone. We have great time during the package. It was my best deal to travel in Turkey and great service for the sites and hotels and excellent guided tours. I highly recommend. 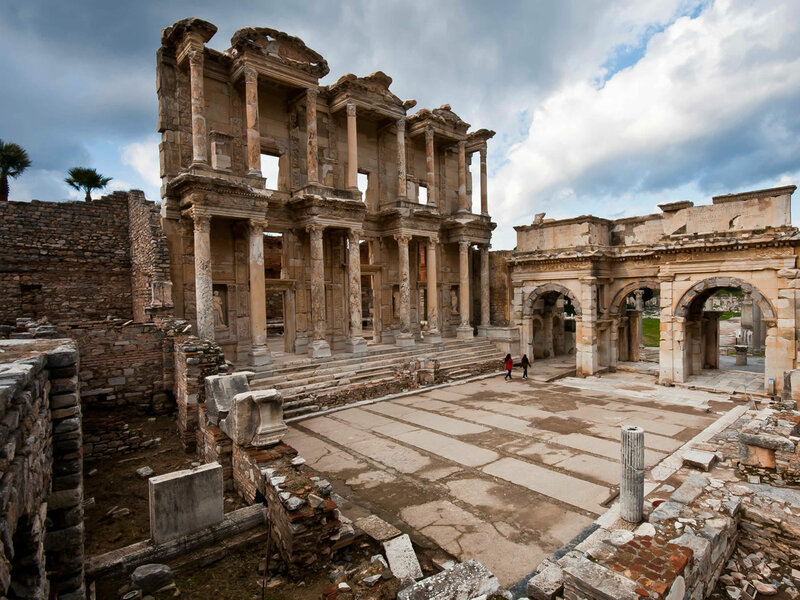 This tour package is the best to visit the war history and ancient world history in Turkey. Put it to your list. We have had this package last week and started from Istanbul, we enjoyed the history and nature in Turkey. We were a family and it is great sites to visit for the family and history, the hotels, tours, transportation were excellent with the guiding service. I highly recommend to everyone. We spent 4 day to visit the Gallipoli, Troy, Pergamon, Ephesus and Pamukkale. Everyday was beautiful. Great 4 day tour of Gallipoli, Troy, Pergamon, Ephesus and Pamukakle and also fantastic service allcanakkaletours.com Enjoyable, worth for money. Well organized pick up, touring in the areas with the professional tour guide, great lunches, nice hotels to stay in Canakkale and Kusadasi. 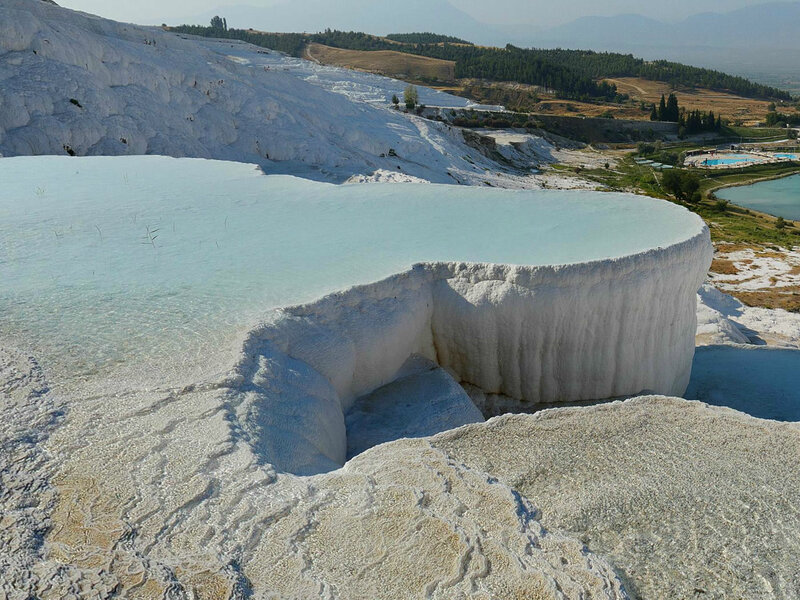 If you go you can make this package to visit Gallipoli and Ephesus, Pamukkale If they are in your list. Great experiences will be waiting for you. All the best. From beginning to end of the package, we enjoyed everyday with the different tour guides everyday. It was nice to meet different people around the world and share something. Thanks. 4 Day Turkey tour package which covers the sites that we want to visit of Gallipoli, Troy, Pergamon, Ephesus, Pamukkale with a professional tour guide. It was excellent to have knowledgeable tour guides during the each site. I highly recommend this service to anyone who is thinking to make the war history tour in Turkey. We used the package and injoyed the from beginning to end of it. It was our first time in Turkey and we have the great experiences about he tourist sites, locals, meals, beaches. In this tour we have had all those experiences, but especially touring and guiding was excellent thanks to everyone during the our days and tour guides. Thanks to tour guide, my wife and me had excellent 4 days during the our visiting of 4 Day Gallipoli, Troy, Pergamon, Ephesus And Pamukkale. It was well arranged and we didnt live and thing that we didnt want, good hotel, excellent tour guide, great transportation. We paid also 399 euro p.p instead of 499 euro p.p , woth for money. Recommended. 4 Day Gallipoli, Troy, Pergamon, Ephesus And Pamukkale Tours was our part of honeymoon holiday in Turkey in the month of December and we had an opportunity to explore Gallipoli, Troy, Pergamon, Ephesus and Pamukkale and spend 4 nights in Kusadasi in charisma hotel. Everything was excellent, thanks. I highly recommend if you want to have different honeymoon. 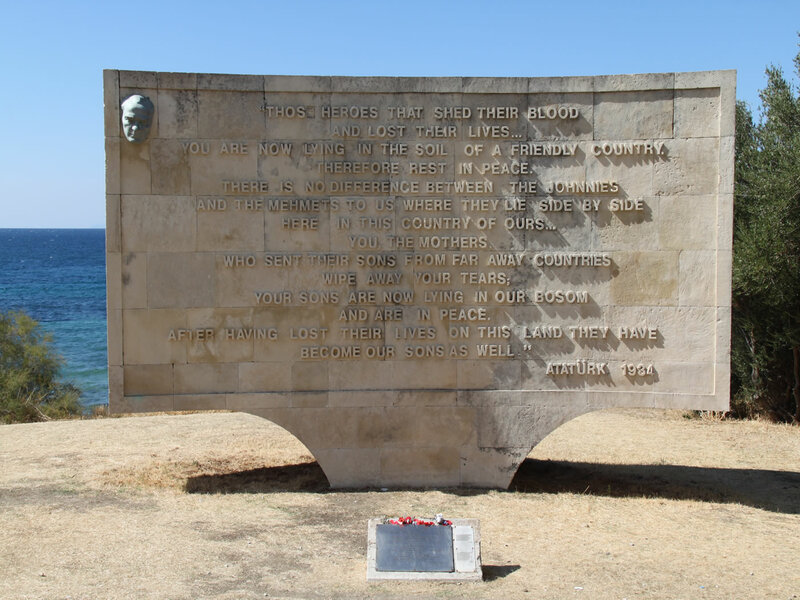 4 Day Gallipoli, Troy, Pergamon, Ephesus And Pamukkale Tours were Great tour, tour guides were very knowledgable and gave plenty of great stories, also provides some nifty photos and information to helped in understanding where things happened and how they related in Gallipoli and Troy, Pergamon, Ephesus and Pamukkale. We joined from Istanbul the journey from istanbul to gallipoli was long but worth to join this package. Recommended. Thanks, it was great service of history, nature and war sites of Gallipoli, Troy, Pergamon, Ephesus And Pamukkale in Turkey. We had great experiences in our holiday in Turkey. With the tour package, visited the sites of history, nature, war in Turkey. It was good experiences with the knowledgeable tour guides. In each site, we had different local tour guide all they were excellent, thanks. 4 Day Gallipoli, Troy, Pergamon, Ephesus And Pamukkale Tours was a historical tour and we visited the battlefield ing gallipoli, Trojan horses and Ancient City of Troy, Pergamon, Ephesus, Hierapolis. The overall experience was beautiful and I want to come again. the best package that you can make in Turkey, I highly recommend to every one to make the tours of 4 Day Gallipoli, Troy, Pergamon, Ephesus, Pamukkale, if there is time, add 2 more and go to Cappadocia. Great service and excellent place to visit. I highly recommend this company for Gallipoli, Troy, Pergamon, Ephesus And Pamukkale Tours. It was an unforgettable experience for us to be in 4 Day Gallipoli, Troy, Pergamon, Ephesus And Pamukkale after delated our turkey tour for a year ! I really loved Turkey, mostly gallipoli... with my families and friends too. Thank you Mr. Cuneyt for giving me a chance to explore Turkey and made us a excellent tour that we will never forget it. Just we returned from the 4 Day Gallipoli, Troy, Pergamon, Ephesus And Pamukkale Tours in Turkey, I want to tell about the tour package that well organized. The hotels was nice and the transportation was safe, thanks for giving us a great time in Turkey. I highly recommend this tour package. We have been in the best place in Turkey with the great tour guides ( because our tour guide was different person every day). Thanks to every one that we had an unforgetable holiday in Turkey. Our Turkey Tours was excellent. The Gallipoli, Troy, Pergamon, Ephesus and Pamukkale Tour Package was great to visit with all the pick up, drop off, guiding, hotel service. The Ancient Cities are the sites that you must visit in Turkey, if you are interested about the war and battlefields, Gallipoli is also must be visited. Staying in Canakkale is a good choise after Gallipoli tour and staying in Kusadasi is an excellent choise, after troy and pergamon and during the Ephesus and Pamukkale. I highly recommend this tour to everyone for Turkey. Is this tour package avilable on april 23. I want to know the price as well? After our visitings in Istanbul, we decided to go to visit the Gallipoli Battlefields and Troy Ancient city and then Epheus and Pamukkale, it was 4 days long and great tour for us to visit the ancient cities while in Turkey. During the our travel the service of the tours, hotels, transportation was good and worth for the money. How much is this tour package if i want to do it in 5 day, instead of doing Troy and Pergamon in a day, I want to spend more time during the tours?